Approximately 5½ hours. Daily departures at 1:30 PM. Venture on a spectacular cruise across Portage Lake, home to Portage Glacier, on this half-day tour. Before your breathtaking cruise, you’ll drive to the Alaska Wildlife Conservation Center where you’ll tour this great wildlife sanctuary. Next, board the mv Ptarmigan, the only boat operating on Portage Lake, for an unforgettable one-hour cruise across an iceberg-dotted landscape. Standing just 300 yards from a relic of the Ice Age, you’ll watch for fractures of ice break off the glacier and crash into the water below. Portage Glacier is Alaska’s second most visited attraction and once you see the pristine views in person, you’ll understand why. 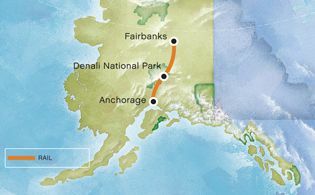 Departure Location: This tour departs from the Westmark Anchorage Hotel, located at 720 W. 5th Avenue, Anchorage, AK 99501. Please check in for this tour at the Westmark Anchorage 15 minutes prior to departure. All bookings must be made at least 5 days in advance.